February's Bloom Day has come and gone, and here I am posting late - again. I'm not even going to bore you with so-called excuses (like the Northwest Flower and Garden Show) from last weekend. I'll just launch right into my flowers. Many of the "almost" blooms of January are beautifully full this month. Daphne odora 'Aureomarginata' is perfuming the entire back garden. Just one bloom cluster brought indoors is an intoxicating harbinger of spring. Also pretty in pink, Arctostaphylos x 'Austin Griffiths' is attracting fat, black bumblebees this month. It's a welcome sight out our deck door. An unknown Hellebore, trying not to be noticed in the back of a bed. Here's the Hellebore I showed in bud last month, now fully in bloom and suffering a bit from slugs. 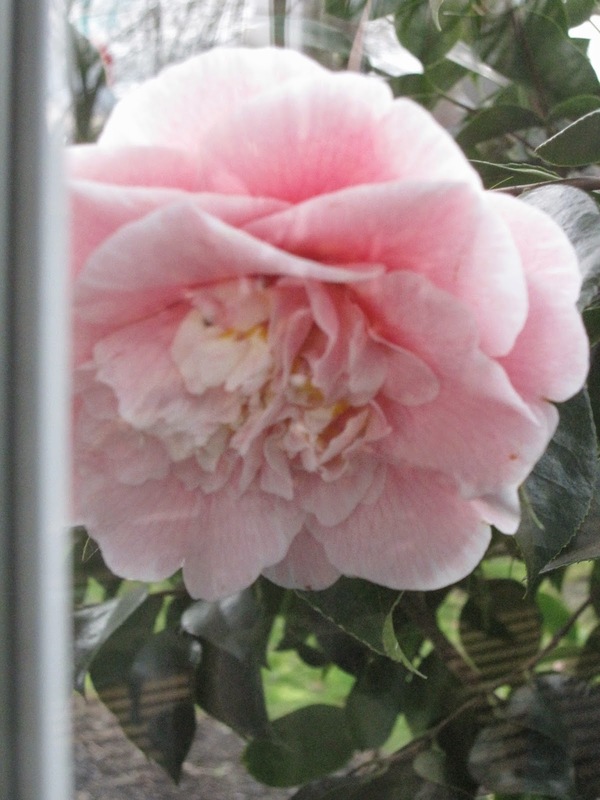 I had to take these photos of our two NOID Camellia japonica out the living room window where the blooms first showed - I couldn't get to them from outside. I apologize for the distracting reflections, but it was the only way I could capture anything of these big blooms that face the house. Camellia x 'April Kiss' is blooming in her perfectly symmetrical whorls. The tiny urn-shaped flowers of Vaccinium ovatum are making an appearance. 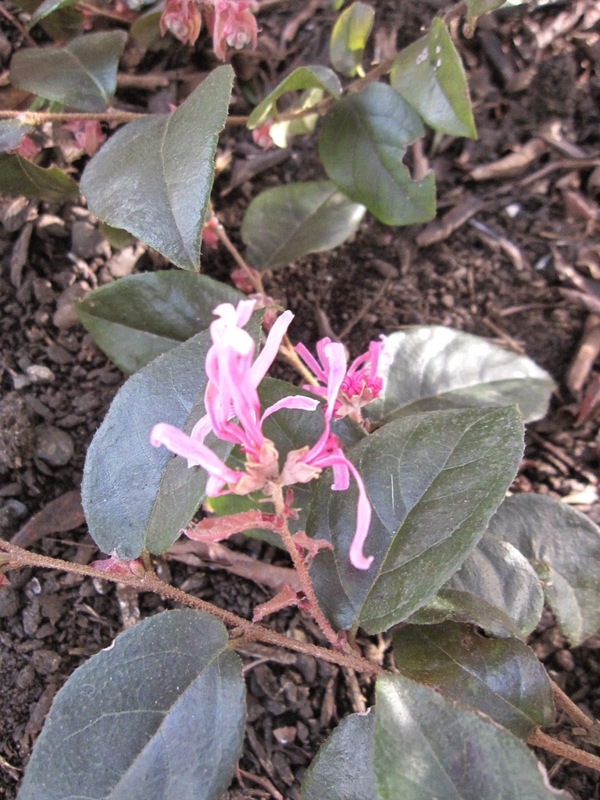 Loropetalum chinense 'Sizzling Pink' is sending out a few thready blooms. We also have quite a few indoor blooms this month. 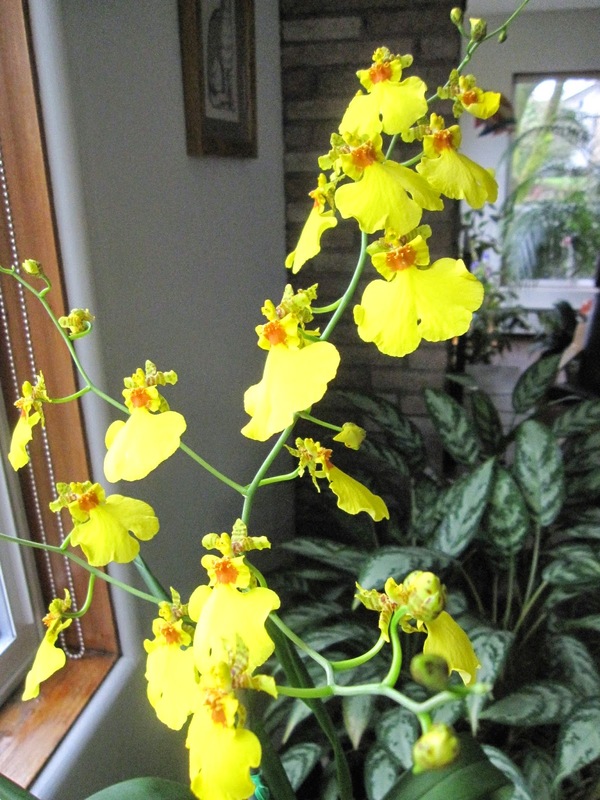 This orchid (the tag long-since lost) was blooming when we returned from California, and it continues to brighten our dining room. The last two blooming stems of Clivia miniata are almost done. I'll miss their gorgeous clear orange flowers when they're gone, although their strappy, deep-green foliage is a nice consolation. We are lucky to have blooming stems of Streptocarpella many months of the year. 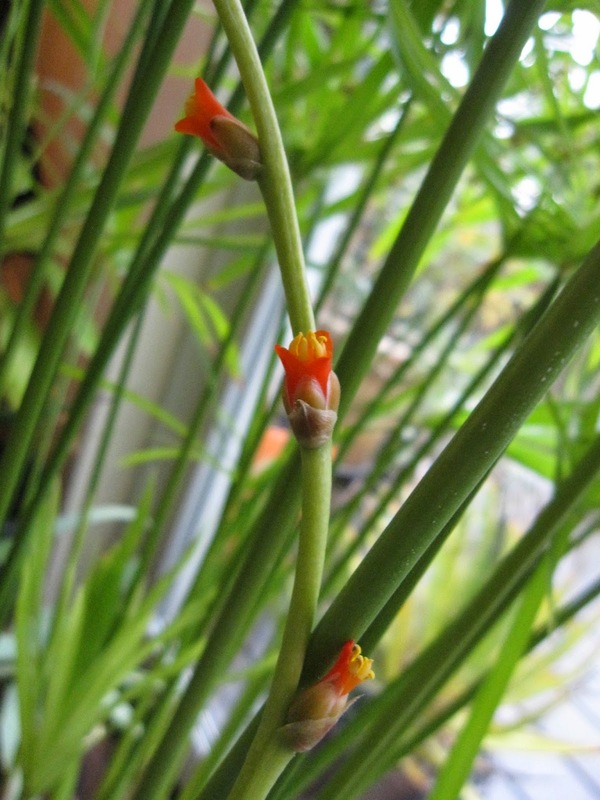 Can you guess what plant is sending out this long bloom stalk? 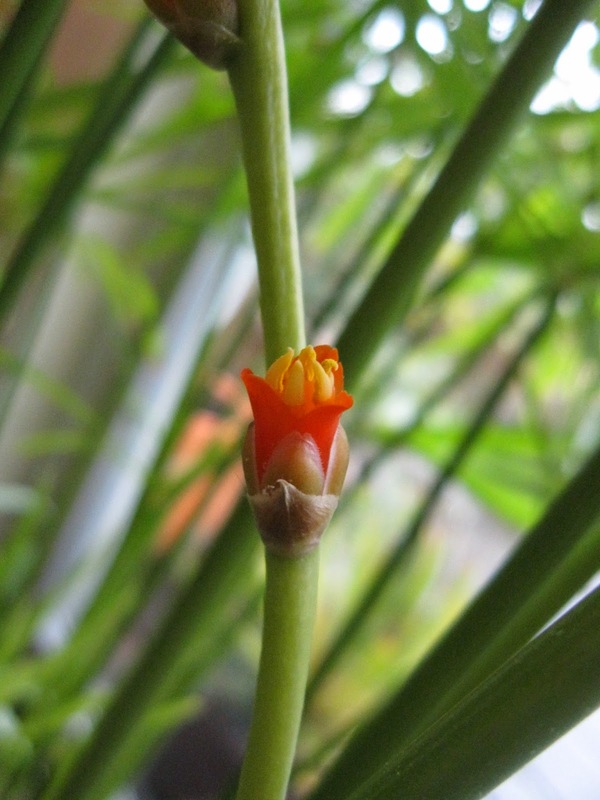 The flower's mix of red-orange and yellow is one of my favorite color combinations, but they are unassuming little blossoms about the size of my little fingernail. 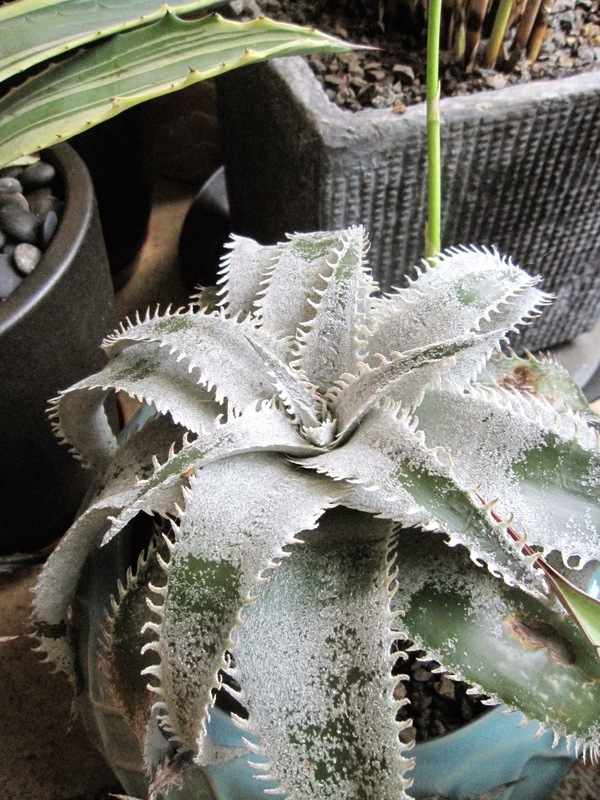 If you guessed Dyckia, you were right, although I don't know the species. See the stalk going up on the right? I'm going to leave you with the fluffy little flowers of dwarf Papyrus, Cyperus involucratus 'Baby Tut', that have bloomed for months now. I love how they remind me of summer's warmth. Despite my poor example, Bloom Day is hosted on the 15th of the month by Carol, at May Dreams Gardens. She has lots to see there, so if you haven't already, do pay her a visit. I'm ultra-late with my Bloom Day post. I took these photos on January 17th, but didn't get to posting this until today. Although this is likely the latest Bloom Day post ever, I'm emphatically not looking for the prize - I just wanted to record my garden's progress, so I'm going ahead and posting what was happening just a few days after Bloom Day in January. Arctostaphylos 'Austin Griffiths' was beginning to bloom on its south-facing side. Although they were small, the flower clusters were thick all over the crown and are more and more glorious as they open further. The much-maligned Vinca minor struggles to survive in the inhospitable ground around my front yard trees. While most Portlanders are eradicating Vinca as a thug, I'm enthusiastically cheering it on as the only thing that will grow (sort-of) there. 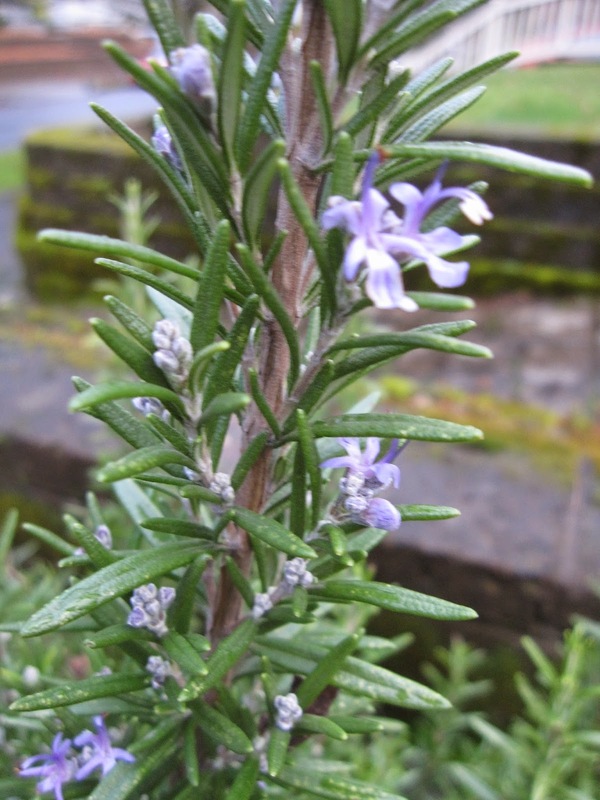 Rosemary is often the earliest to bloom, and this prostrate variety is no exception. This plant was actually sold as Barbeque Rosemary. I get the moniker, but I'll wait until it gets a bit bigger to start clipping skewers from it. Now we're into the "almost" part of this post: a NOID Camellia japonica. Sarcococca hookeriana var. humilis hadn't started to drift its scent around the garden, but it can't be far off, especially now. This entry qualifies as both "little" and "almost". Daphne odora 'Marginata' was almost popping. I resent handing over the space this shrub occupies most of the year, but I love the fragrance when it blooms. The third and last of my three Camellia sasanqua 'Yuletide" was finally blooming. A little post-holiday of it, but it gets the most shade of the three 'Yuletides'. Mahonia repens. Still waiting for those bright yellow flowers. 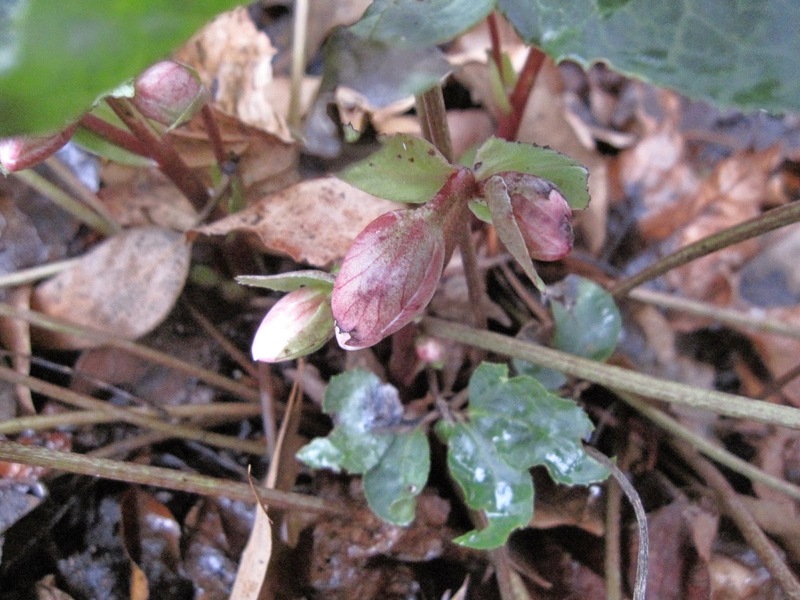 And last, a NOID Hellebore in deep shade is taking its sweet time, even now. Check back in mid-February, when I'll just be returning from the Northwest Flower and Garden Show in Seattle. If the blogging goddess is with me, I'll post on the progress of all these "almosts" and hopefully a few new blooms. Though you'd be hard-pressed to tell from the timing of this post, Bloom Day is sponsored on the 15th of each month by Carol of May Dreams Gardens. Click over to see what was blooming in January all over the place.